The winter sun that basked James Stephens Park in Ballina on the second Sunday in January gave the 2,000 odd who packed into the north Mayo venue a taste of what lies ahead later on down the track when summer finally comes around, albeit with a winter breeze whipping in on top of them, just in case they were in any doubts that it was still just after the turn of the year. What they saw in front of them was a workmanlike performance from a Mayo side, still finding their feet under their new management regime, doing what they had to win the game and set up an interesting encounter in Hyde Park next Sunday with a place in the FBD final up for grabs. Mayo showed six changes from the side that started the previous week against NUIG with Matthew Flanagan getting the nod in goal and Ger Cafferkey, Keith Higgins and David Kenny coming into the defence, Caolan Crowe partnered Jason Gibbons in the middle of the park and Andrew Farrell was handed the number 12 shirt. It was the Killala man who opened the scoring with less than 30 seconds gone on the stopwatch, he applied a fine finish to a move out on the stand side of the field after Jason Doherty and Mark Ronaldson had worked the angle for Farrell to have a cut. That score came direct form the throw in after Mayo had won the first ball of the day in the middle third. This was a sector that Mayo bossed for the whole game, with Jason Gibbons putting in an eye catching display at times. He was able supported by Garrymore’s Caolan Crowe in the middle third all afternoon. Jason Doherty stretched Mayo’s lead out to two points in the second minute when he clipped over a close range free after Keith Higgins had intercepted a IT Sligo attacking move and set Mark Ronaldson away before his run was stopped illegally. The buzzing Shrule Glencorrib man was in top form again in this contest kicking four points from play and his turn of pace and fleet of foot style caused problems for the students all afternoon. The very impressive Adam Traynor cut the gap back to a single point seven minutes in from a free. The Truagh clubman finished with six points for his efforts over the hour and was the only real threat that Mayo faced in an attacking sense all day. Before that Traynor point Mayo had their first goal chance of the day when a move started at the back by Higgins was worked into the hands of Jason Doherty, but his effort cannoned off the thigh of Ross Gallagher and away to safety. Mark Ronaldson opened his account for the day with a point from almost 40 meters out after Jason Gibbons had won the ball back for Mayo breaking down an IT Sligo attack. Straight from the kick-out after Ronaldson’s score Gibbons once more won the ball and he fed Ronaldson who shifted it on to Keith Ruttledge who fired over the first of his three points on the day. Lee Carr responded for the students on the quarter of an hour mark with a well taken score to leave the score at 0-4 to 0-2. Ronaldson and Ruttledege kicked two quick points to put Mayo four clear before 20 minutes had elapsed on the stopwatch, the Shrule Glencorrib man tagged on one more minor before the turn around with Traynor responding for the visitors to send Mayo in leading by 0-7 to 0-3 at the short-whistle. The second half opened up with Jason Gibbons having a goal chance blocked by IT Sligo defender Kieran Donoghue two minutes in, however the play was called back for a foul earlier in the play and Jason Doherty nailed his second point of the day from close range. Ronaldson rounded his scoring run of the day off not long after and by the 40th minute, Mayo had their tenth point of the day on the board thanks to Ruttledege’s second point of the game. Mayo kept piling on the pressure and points followed from Kevin McLoughlin (twice ) and Darren McHale and Mayo were leading 0-14 to 0-6 after 48 minutes. Ten minutes from time, McLoughlin found the back of the net, after the ball fortunately broke his way right in front of the goal and he made no mistake from close range and with that finished the game off. Mayo did go on to add two more points before the final whistle with subs Tom Parsons and Conor Loftus raising the white flag before the end. 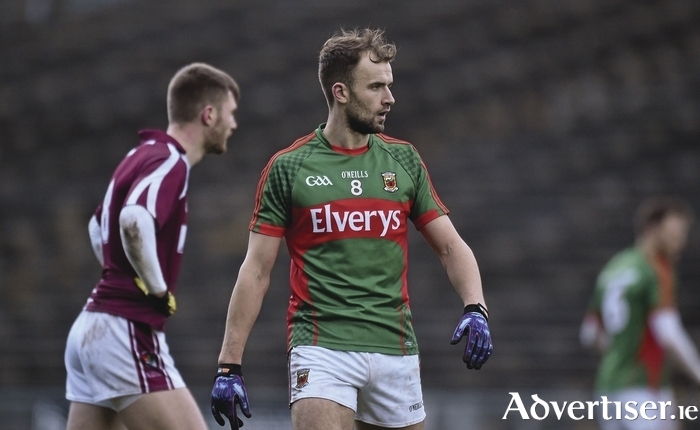 Loftus’ was a fantastic effort and is something that Mayo supporters will hope to see more of over the course of the year as the young Crossmolina man finds his feet in the senior inter-county game. This game was another case of job done for Stephen Rochford and his side and now sets up a game next week that should be much bigger challenge for Mayo than they have faced over the past two weekends.